Very thorough and in depth introduction to the world of programming. Can be a bit intimidating at times for younger kids, and textbook style may be a turn off for kids not fond of school. Python for Kids is a very thorough introduction to the art of programming. As thorough as a course in programming, it walks you through each new concept step by step, gives you the tools to use them, and then pushes you to play around with it and discover what you can do. While Python for Kids won’t give you the instant gratification of writing a game in two hours, it will give you a solid foundation to build on (and you will get to that game by the end of the book). Sorry, kids. It’s not that kind of python. Maybe you are a parent, wishing hopefully that little Johnny will translate his hours playing video games into a viable career. Maybe you’re a precocious kid, who just wants to learn how to write a program to make his computer do his math homework (hey, I said precocious, but he’s still a kid). Maybe you’re an adult who has no background in programming whatsoever, and you want a really gentle introduction to a somewhat scary new endeavor. 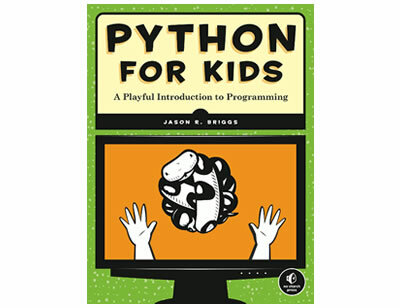 Whoever you are, if you’re looking for an in-depth yet very accessible approach to learning to program, Python for Kids offers a whole lot of knowledge in a step by step way that will have you writing code in no time at all. Nearly everyone knows how to use a computer these days. They are a near essential part of modern life. But how many of us know what actually goes into something as seemingly simple as a Google search, or as complex as an operating system? While computers are capable of amazing feats of computation at amazing speeds, when it comes down to it, they can only do what they’re told (as far as I know, the robot overlords are still years away from gaining an upper hand). So who tells the computer how to find all the Chinese restaurants in New York City, or how to calculate massive payrolls, or even how to make the little spaceship graphic shoot at the tiny aliens? Programmers do. If you have any basic knowledge of programming, then you’ll know that programmers work in a variety of different languages. These are not languages like French of German, but programming languages like Java or PHP. However, it is similar to a foreign language in that learning them requires you to learn an entirely new way of speaking (at least to the computer). Python for Kids teaches the python programming language, naturally, and it was chosen for it’s ease of use for beginners and useful features. In textbook fashion, the book walks you through the basics in a way that builds skill upon skill. This isn’t a book that can be worked through in a an afternoon, but it is a book that, when completed, will leave you with a really good start in programming in general and Python in particular. The book starts out by giving step by step instructions for installing Python on your computer, be it running MacOs, Windows, or Ubuntu, and then jumps right into basic programming terms. Because it is for kids, time is taken to explain things like order of operations in mathematic equations or 90 degree angles, and in fact, most of the first lines of codes you write are of the mathematic calculation type. From variables and strings, to tuples and functions, every term is very thoroughly explained. While it can get a bit dry at times, the author takes great pains to explain how each of these bits and pieces build on each other to make those massive programs we all use day in and day out. 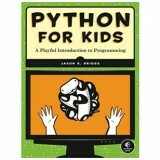 As I said, Python for Kids is presented in textbook style, complete with assignments at the end of the chapters. Each chapter gives you a basic building block of programming, explains it fully, and then has you apply that knowledge in simple lines of code. While the textbook formula works really well for imparting this type of knowledge, it could be a turn off for kids who aren’t real fond of school. The author of the book, Jason Briggs, has done a lot to keep kids engaged, from having them write silly jokes into their code, to spreading colorful illustrations of monsters, animals, and more throughout the book. All that makes it a lot more kid friendly, but make no mistake: learning to program is work. A motivated kid who is intent on learning (particularly those who have an affinity for math), should do fine, especially if they have someone to turn to with any questions. While the book is suggested for ages 8 and up (the age the author himself began programming), it may be a bit too much for some kids (or even adults) to take on. If you find your kids (or yourselves) are really motivated to learn, but just get frustrated too easily, I would suggest picking up Super Scratch Programming Adventure to get an even more basic start, and then coming back to Python for Kids as the second step in your programming venture.